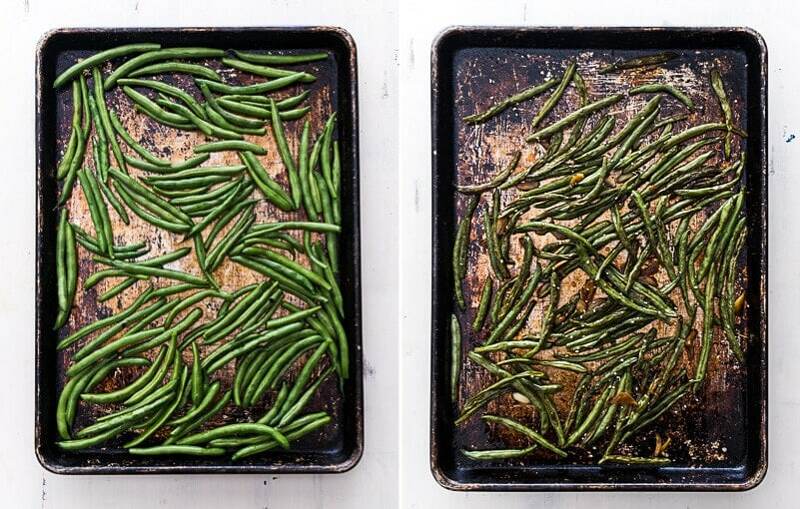 Try using this method to cook green beans for Thanksgiving this year and say goodbye to dull tasting side dishes! A few years back, I shared a dry fried green bean recipe (干煸四季豆) . It is a signature Szechuan dish that is quite unknown outside of China. Since then, it has become one of the most popular dishes on my blog. I also received many emails from my readers, asking whether it is possible to cook it ahead and serve it later, and whether it’s possible to cook it in the oven. The answer to both questions is a big YES! Before moving to the US, I seldom used my oven and hadn’t discovered the beauty of roasted vegetables. To create delicious green beans that are blistered on the surface and tender in the center, we usually use a wok to slow roast the beans on the stove top, to create a similar texture. When I learned the proper way to roast vegetables in the oven, I was immediately hooked. It is SO MUCH easier, and creates perfect results every single time. Today I want to share the oven version of the Szechuan dry fried green bean recipe. 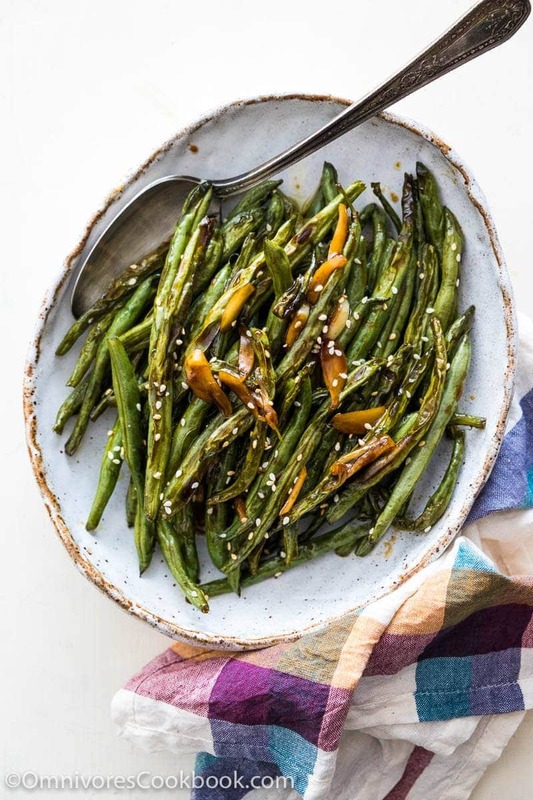 These green beans are roasted until blistered, and then drizzled with a garlic soy glaze. It is fuss free and can be prepared ahead of time. I promise you these beans are so flavorful and addictive, that you can even serve them as a main dish over steamed rice. 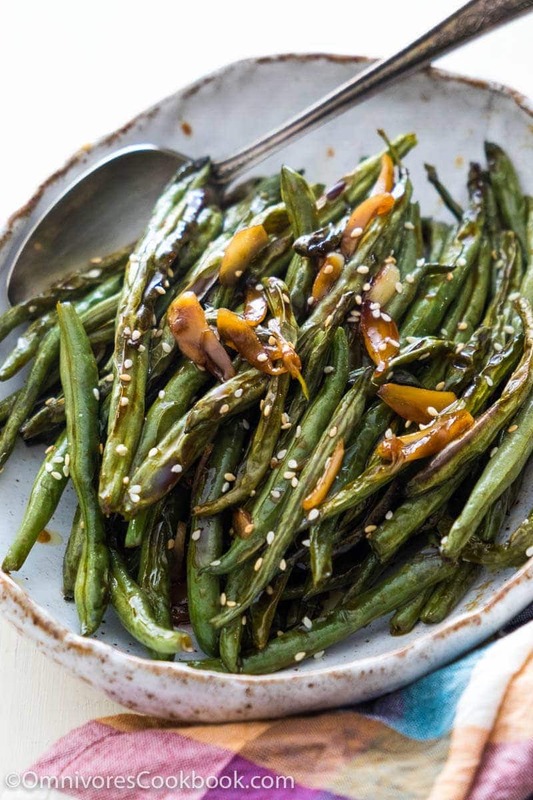 If you’re tired of your usual green bean side dish, give this recipe a try. You’ll love it! For more delicious and easy side dishes, check out Miso Glazed Carrots, Roasted Baby Squash, and Cantonese Broccoli with Oyster Sauce. Preheat oven to 230 degrees C (450 F). Line a baking sheet with aluminum foil for easy cleanup, if needed. Dry the green beans thoroughly with a paper towel. Spread onto the baking sheet. Pour on olive oil and sprinkle with salt. Toss to mix well. 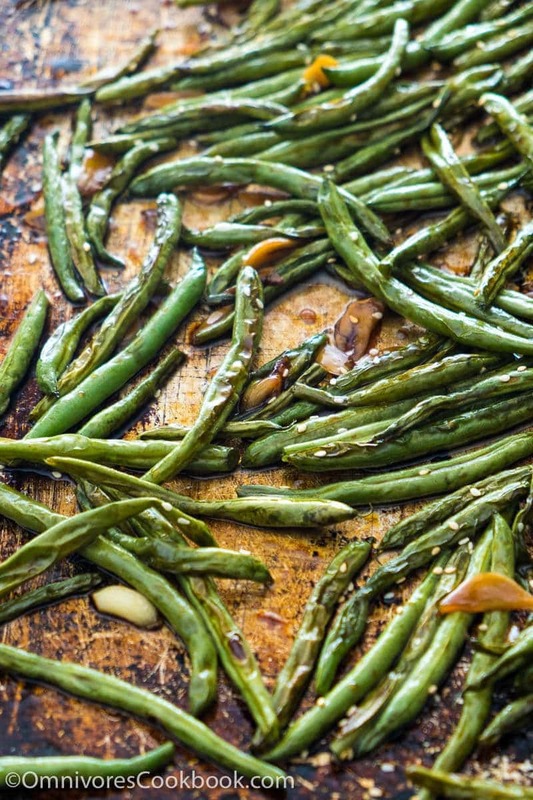 Shake the pan and use a pair of tongs to arrange the green beans into a single layer, to ensure even roasting. Bake for 12 minutes, until browned and almost tender. While baking the green beans, prepare the garlic sauce. Mix soy sauce, chicken stock, sugar, and cornstarch in a small bowl. Heat the olive oil in a small saucepan over medium heat until warm. Add garlic. Stir for a minute or until fragrant. Add the soy sauce mixture. Let cook until boiling. Stir and cook until the sauce thickens. Pour the sauce over the green beans. Toss to mix well. Place them back into the oven and let bake for another 2 to 4 minutes, until the sauce is caramelized. 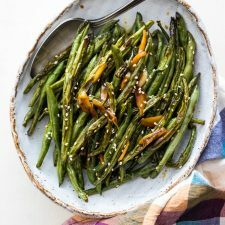 You can cook these green beans ahead and store them in an airtight container in the fridge for a day. Reheat at 180 C (350 F) in the oven or microwave until warmed through. Your Post is so nice……. Green beans are my favorite Chinese dish 🙂 But what I love about this is the dish they are on! So beautiful and unique Maggie. Loving all you’re doing lately. I’m going to try this with broccoli, since that’s what we have right now, and with green beans next summer. I think I’ll work in some hot peppers, too. Roasting is my fave way to cook veggies, and I love the sound of the easy sauce you’ve drizzled over these. Perfect for any special table! i can’t wait to make this. Question though, what’s on top of the green beans in your photo? looks like maybe sesame seeds? that’s not in the recipe???? also what are the yellow things? is that the sliced garlic? Hi Betty, the topping are sliced garlic and sesame seeds. I cooked them in the sauce so they turn to a brownish yellowish color. Happy cooking and hope your dish turns out great! Here’s an idea folks. Why don’t you NOT COMMENT until you’ve actually made the dish. Writing stupid comments like “Oh, it looks so pretty” or “I love roasted vegetables” is a waste of everyone’s time. So delicious that I’ve made these once a week since discovering the recipe. Good as a side dish with other recipes here, or as a main dish over rice with a bit of extra sauce.